(e.g. CD ROM etc.) without my prior written consent. Michael Dranfield. Some sophisticated equipment is required if you want to be able to repair the latest digital consumer electronic products, for example digiboxes. In particular the complex ICs they use, with connections such as the ball-grid array, can be replaced only by employing advanced rework equipment. Michael Dranfield has been involved in this type of work for some time and relies on an ERSA IR500A rework station. 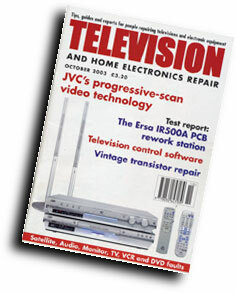 It's an expensive investment, but has proved to be the answer to the problemWhen faced with a steady decline in the number ofVCRs and microwave ovens coming in for repair (because of the low price of new ones). I decided that it was time to diversify and look for an alternative way to boost the takings. Having been devoted to all things electronic since the age of about six, and self-employed since I opened my first shop in 1985, I wanted to stay in the industry I knew. About two and a half years ago a dealer who has a shop over the road from me brought over a Pace 2200 Sky digibox that he had sent to Pace for repair. It had been returned with a note to say that six ICs had been replaced. that this had failed to cure the problem, and that the digibox had probably been subject to a high-voltage surge down the telephone line, making repair uneconomic. I obtained a service manual and played about with the digibox on and off for the next four weeks. Eventually I found the cause of the problem and fixed it. much to the amazement of the dealer who had brought it to me. Over a period of time he brought me more digiboxes for repair, and I gained much valuable experience. Replacing chips with a simple Pyropen was a slow and tricky job. So, with the money this work had brought in, I decided to invest in some high-tech equipment - a top-of-the-range Pace MBT250 digital desoldering station, a real-time digital storage oscilloscope, etc. I was soon repairing more and more digiboxes, but subsequently came across a problem. 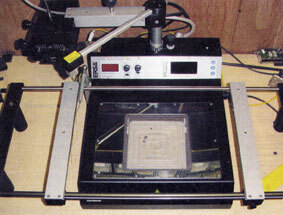 The then new Pace 2500S uses a microprocessor with a special type of encapsulation called a BGA (ball-grid array). The BGA consists of 256 solder microballs that are arranged in a grid pattern beneath the chip itself- no pins or contacts are visible around the outside of the chip. This type of chip started to fail regularly, causing various symptoms such as stuck in standby, no sound, etc. More and more manufacturers then began to use chips of this type, and I was suddenly coming across digiboxes I couldn't repair, because I didn't have the specialist equipment required for replacing BGA chips. I spent the next few weeks searching the internet at home during the evenings, typing in the key letters 'BGA'. This brought up thousands of references and, after sifting through them to find UK companies that offered EGA rework machines. I sent off for some catalogues. One I received was from a company in Coventry called Blundell Production Equipment. The rework machine for which this company is the UK agent really took my eye: its features and technical specification are very impressive. After a long chat with the sales representative at past seven o'clock in the evening I booked a demonstration for a Wednesday, when the shop is closed. He turned up at 3.30 p.m. as promised, with a sample machine. It's made by a German company, Ersa. The demonstration lasted till well after 7 p.m. I was so impressed by what I had seen that I bought a machine there and then. Actually when I made the appointment I had asked the representative to bring a new machine along in case I decided to buy one. This would avoid the need to pay a delivery charge. The machine I bought, see Photo 1, is an Ersa IR500A, whose heating system uses medium- wavelength (2-8/^m) dark infra-red radiation. I had considered the Pace hot-air system. The main drawback with this was the running cost. You need a different nozzle for each different size of chip. These nozzles cost anything up to £90 each, so you could spend almost as much on accessories as the station itself. The Ersa IR500A uses a patented aperture system. Four control knobs on the overhead radiator, see photo 3, enable you to set the X-Y aperture size from anything between 10 and 50mm, which covers most of the chips you are ever likely to come across. There are no running costs part from the need to replace, quite frequently, the silicone suction cups used by the automatic vacuum chip lifter. They lead a hard life. I've just received some extra long-life samples, but have not yet had time to try them out. I originally bought the IR500A for BGA rework, but soon found that it can be used to remove and replace not only BGAs but any leaded chip. PLCC and even PLCC sockets can be fitted. A big advantage with the IR500A is that any leaded chip can be removed from a PCB without a single pin being out of place. This is a very important factor when you consider that some digibox chips cost upwards of £30 each. If you replace a chip and this doesn't cure the fault, the old chip remains reusable. Photo 3 shows a 208-pin ST20 microprocessor chip that has just been removed from a Pace 2500B digibox. Not a single pin has been damaged. Photo 4 shows the PCB after cleaning up with desoldering braid. As you can see. no damage has been done to the tracks and the PCB is ready to have a new IC fitted. microprocessor chip in a Panasonic TU-DSB30 digibox costs £60 plus VAT. Replacing a BGA chip requires critical under-board heating. This is taken care of with the IR500A. and use the fixed-axis laser-positioning device to find the centre of the IC to be removed. Next set the X-Y aperture size, using the four control knobs on the top infra-red heater - add 5mm all round to the overall size of the chip. Then place the K-type thermocouple as close as possible to the chip. Switch on and preheat the underside of the PCB to 60°C. The ramp rate is set by the left-hand potentiometer. When the LED display indicates that 60°C has been reached, rotate the top IR radiator and lower it down over the 1C. The upper radiator ramp rate is set by the right-hand potentiometer. At about 150°C, indicated by the LED readout, push the spring-loaded suction pad down on to the top of the chip, and click the mouse switch to start the vacuum. The chip will automatically be lifted from the PCB at reflow, which occurs at approximately 179°C. When the chip is lifted off, swing the top IR radiator over on to its rest position and click the mouse to end the vacuum: the 1C will then drop off on to the catching plate. Slide the PCB over to one side of the board holder and allow it to cool. The whole process, from start to finish, takes only a few minutes. When a new MAX2104 ZIF chip has to be fitted in a Pace tuner the metal square on its underside, see phot 5, must be soldered to the PCB groundplane  this is not only the RF groundplane connection, it also provides heatsinking for the chip. This job is impossible with conventional soldering gear. It's so simple with the IR500A. A pre-settable on-board temperature alarm can be set up to sound when the correct temperature has been reached, leaving you free to get on with another job. Consistent and repeatable results are achieved time after time. The IR500A comes with a built-in digital temperature controlled soldering-station module that can drive up to four soldering devices at the touch of a button. From the hot-SMD tweezers to the micro-soldering iron, this is ideal for rework and touching up. Four soldering tools and holders, with sponges and spare bits. are supplied as standard with the IR500A package. I would thoroughly recommend the SMD micro-soldering iron. A whole range of micro-well and micro- soldering bits is available. By pre-heating the PCB first, say to 100°C, soldering at low temperature can be achieved with really excellent results. A year has passed since I bought my IR500A. and I can't describe how pleased I am with the unit itself and the after-sales service provided by Paul Cooper of Blundell. He gave me his mobile phone number, and is always on hand to answer any questions. My one and only criticism of the IR500A is the position of the on/off switch. It's under the component catching plate, behind the thermocouple mounting bracket, the most inaccessible place possible. Why couldn't it have been on the front panel, say next to the turbo-heat button? If you repair digiboxes regularly, your workshop needs this machine. I recommended it to a friend in London who bought one and has been pleased with it. At the time of writing this review the price of the IR500A package, complete with four soldering hand tools, spare bits, a tip-changing tool, board cooling fan, hand-held temperature-meter, PCB holder and soldering-iron stands, is £4,650 plus VAT and delivery. Blundell Production Equipment also sells a vast range of rework and manufacturing equipment. The firm can be reached on 02476 473 003. fax 02476 694 155 or email sales@blundell.co.uk There's a website at www.blundell.co.uk You can phone Paul Cooper on his mobile 07880 546380 to arrange a free demonstration. Some parts of the country are served by another representative. 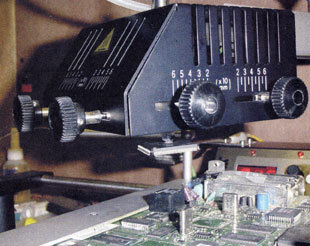 Picture 1: Michael Dranfield's ERSA IR500A PCB rework station. The overhead radiator is at top left. Picture 2: The 256-pin BGA microprocessor chip type ST15512SWE used in the Pace 2500S3 digibox, top and bottom views. Picture 3: The overhead IR heat radiator, with its suction cup holding a 208-pin ST20 microprocessor chip that has just been removed from a Pace 2500B digibox PCB. There's not a pin out of place, and if the chip proves to be OK it can be reused. Picture 4: PCB after removal of a 208-pin 1C and cleaning up with desoldering braid. No PCB or track damage has occurred. 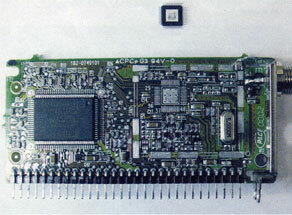 Picture 5: A MAX2104 ZIF chip (top) after removal from the tuner (below) used in the Pace 2500B digibox. 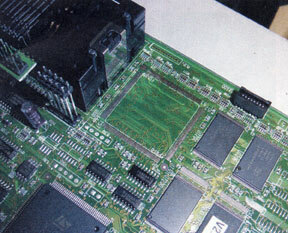 The metal section at the bottom of the chip, shown in this photo, has to be soldered to the board. This is impossible with conventional soldering gear.